For the Lending Club loan analysis, I selected the historical loan data provided by Lending Club (LC). I downloaded the data file on May 1, 2012. It contains 41 distinct variables about Loan, Loan Application, Borrower, and Loan Repayment. The data file provides information on 51,768 loans issued between June 2007 and April 2012. There are additional 2,749 loans in the data file that are listed as loans that do not meet the current credit policy. These 2,749 loans were not included in this analysis. There are 326 loans with application date from April 3, 2012 onward that are funded and with status 'In Review' but not yet issued. These 326 loans were not included in this analysis either. Each loan in the data file has one of the nine status listed - Current, Fully Paid, Issued, Charged Off, Default, Performing Payment Plan, Late (31-120 days), Late (16-30 days), and In Grace Period. According to the data found at the site of Board of Governors of the Federal Reserve System, in Q4 of 2011, the Credit Card Charge-off Rate was 4.53% while Delinquency Rate was 3.32% for all commercial banks on non-seasonally adjusted basis. For Lending Club, the charge-off rate (loans with Charged Off and Default status) was 3.64% and delinquency rate (loans with payment past due 30 days) was 0.96% as shown in chart below. Charge-offs, which are the value of loans removed from the books and charged against loss reserves, are measured net of recoveries as a percentage of average loans and annualized. Delinquent loans are those past due thirty days or more and still accruing interest as well as those in nonaccrual status. They are measured as a percentage of end-of-period loans. The LC charge-offs were calculated using number of loans instead of amount charged off and over multiple years instead of on annualized basis. If possible, I will try to rectify this difference in future post when the loan issue date and loan status are reviewed. I am not sure if Lending Club reports charge-offs and delinquencies to SEC as I didn't find this information in LC's SEC filings. If I missed this information, please let me know. At this point, I assume that the profile of Lending Club charge-offs and delinquency rate is similar to or worse than that of commercial banks considering that the commercial banks can access much more personal information about borrowers than the lenders on Lending Club. 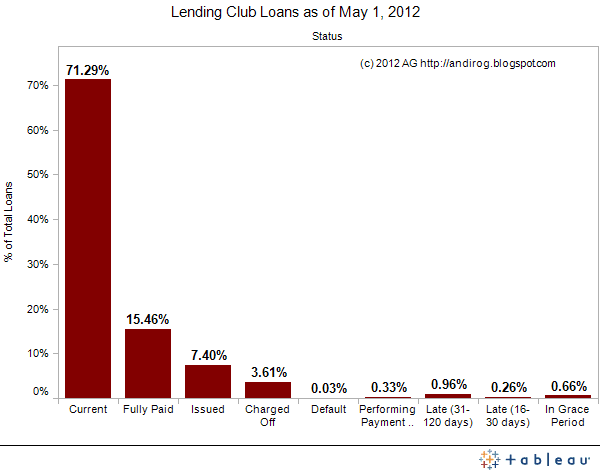 Lending Club reports the recovery rate as "partially or fully recovered." Without knowing more about "partially recovered," I believe the calculated default rate of 4.44% underestimates the actual default. Incorporating unrecoverable rate in default expectation makes the analysis more complex, especially when I start to slice and dice the data. I may attempt to incorporate this complexity in future iteration of analysis. For the purpose of this analysis, I will consider any loan as "Default" that doesn't have status as Current, Fully Paid, or Issued. Based on this assumption, the default rate is 5.85% for the whole population of loan in this data file from Lending Club. From next post, I will start exploring loan data further and review each variable for loans and associated default rate. Next up on the block is Loan Issued Date and Default Rate. Recently Ross Asset Advisors published a good overview of peer-to-peer consumer lending "Investing in P2P Loans." Check it out. A web service to help lenders on peer to peer lending platforms with new loans selection, portfolio analysis, and secondary market note pricing. All data and information provided on this site is for informational purposes only. Random Thoughts is not compensated unless readers choose to sign up or purchase by clicking through the provided affiliate banners and links. Random Thoughts makes no representations as to accuracy, completeness, currentness, suitability, or validity of any information on this site. All information is provided on an as-is basis. © 2012 Anil Gupta. Awesome Inc. theme. Powered by Blogger.